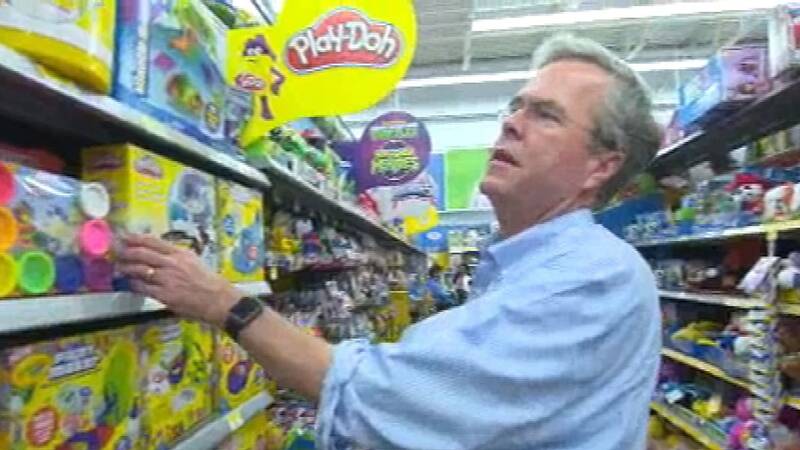 MIAMI—Jeb Bush is getting a late start on his holiday shopping this year because he’s been busy working toward the gift he really wants: a top finish in New Hampshire’s presidential primary come February. The governor held seven town halls over four days leading up to the Christmas holiday in the state where his campaign has invested its last hopes of emerging a viable contender for the Republican nomination in 2016. But fresh off a plane from New England, Bush and his son stopped at a Miami-area Wal-Mart for last minute shopping where NBC News was granted exclusive access. Wednesday’s shopping trip was part charity and part necessity as the governor roamed the aisles collecting toys and games for the Miami Children’s Health Foundation, while also gathering the ingredients for his favorite steak and guacamole post-Christmas meal. The Christmas break provides a brief respite for Bush from the political scene -- where his candidacy sits at just three percent nationally well behind a still-surging Donald Trump in the latest CNN/ORC poll – with time to spend with his family. Bush’s wish for the GOP front runner this holiday included trying to think of the “good things this time of year,” something he said is healthy for everyone, but also suggested a dose of humility for Trump. “Not sure I’m going to go with that…” Bush said upon finding Trump’s latest book among the items for sale. There is one cardinal rule for Bush in the realm of gift giving: re-gifting is fine, but twice re-gifting is not – something he named his son as being guilty of. The governor’s Miami holiday plans include a trip to Catholic Mass and meals with family spanning the Christmas weekend before returning to the campaign trail with events in Florida on Monday. For all celebrating, Bush wished “a restful holiday time and time to reflect on God’s blessings,” saying that’s what he plans to do.